Android smartphone and tablets users who interesting to learn Thai by themselves can have a look for Thai Thesaurus to download and install on your devices. 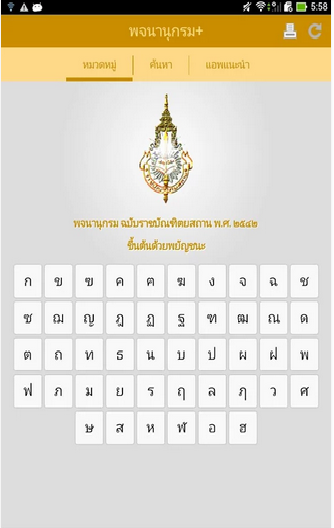 Thai Thesaurus consist of Thai vocabulary ordering by the Thai alphabets (44) ก ข ค ง จ ฉ .... อ ฮ. Light and simple to download and install. Ready to use offline after installing ,no internet connection require. Good for student ,teacher and interesting to learn Thai. How to use for the first time. On the UI Thai alphabet menu display separately ,so Tab on the alphabet which we want to see more vocabulary and description . Search menu on the top : when you know exactly the work and want to go directly to the word and definition. The app can install easy and without any problem. When tap on each alphabet to go for the word and vocabulary it did what it said by provide content same as on the book for Thai Thesaurus ,but may be not the same number as the book version. However ,in my point of view it was enough for anyone who begin to learn Thai and want some teaching aid to help and guide about Thai word or Thai vocabulary. Keep in mind that . The menu on UI is written in Thai ,so at least the learners who want to use this app supposed to have at least some Thai language skills for reading and writing. so far only the ads pop up during the app is working ,but all in all for the benefit of learning and giving a definition of Thai word it was acceptable.